Create a stunning Aquascape with Aqua One's fantastic new range of Vibrance Plastic Plants. There's a huge variety of plant types to choose from featuring an array of colours and sizes. Beautiful, realistic and safe in all tropical, coldwater and marine aquarium setups. 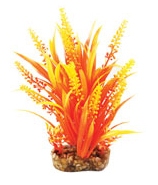 Part of Aqua One's new Vibrance Range for 2015, this Orange Cabomba 20cm Plastic Plant brings both colour and beauty to any aquarium. Use in combination with other great value plastic plants in Aqua One's new range. 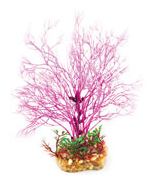 Part of Aqua One's new Vibrance Range for 2015, this Purple Hottonia 20cm Plastic Plant brings both colour and beauty to any aquarium. 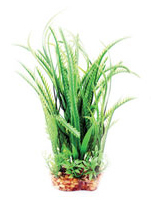 Use in combination with other great value plastic plants in Aqua One's new range. Aqua One plastic plants are both tough and realistic looking. This pack includes the 6 plants shown in the image.